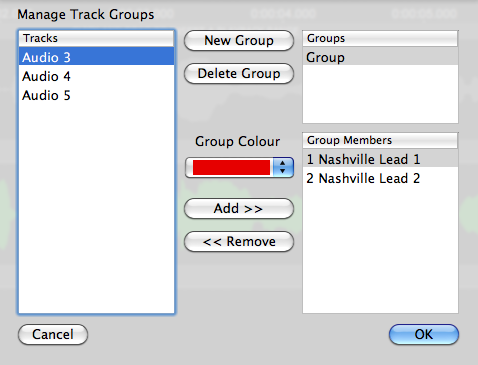 Select the top menu item Tracks > Manage Groups. Highlight the group name in the Groups window top right. Highlight tracks in the list on the left by clicking them (shift or command/ctrl click to add to the selection), and press Add >> to put them in the group selected. In the example below, the first two tracks from the track list shown above have been added to the single group created, leaving 3, 4 and 5 out of it. You can choose a colour to identify the group from the Group Colour drop down. 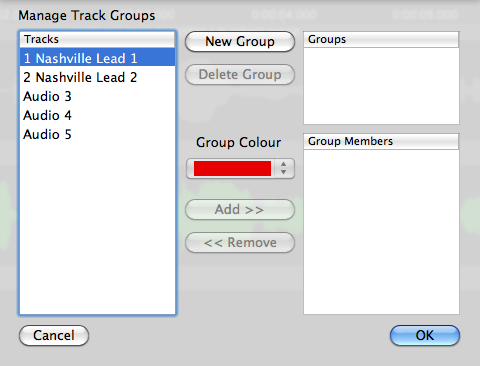 Tracks can be removed from a group by selecting the group name in the Groups window top right, highlighting the tracks concerned in the Group Members list below it, and clicking <<Remove. A group can be deleted by highlighting it in the Groups list and pressing Delete Group.